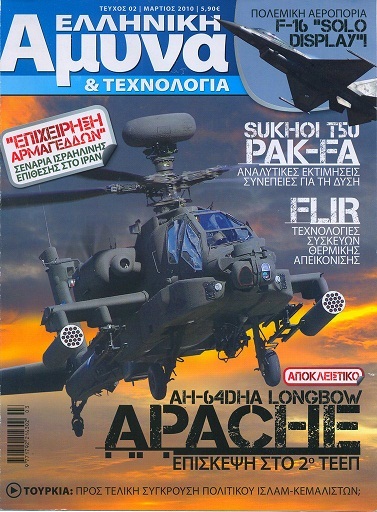 The monthly ‘Hellenic Defense & Technology’ magazine has established itself as the most credible, authoritative and accurate publication of its sector in the Greek language. Written by professional journalists with decades of experience in reporting on defence technology and policy, as well as university teachers on foreign relations and strategic studies, HD&T provides a competent, independent, unbiased and balanced analysis of relevant developments in Greece and the world, unique in the Hellenic media. It was first published in February 2010. The main subjects covered by the magazine are: Hellenic defence and security policy, as well as foreign policy; home and international activities of the Hellenic armed forces; procurement programs of the Hellenic Ministry of National Defence; European and international defence and security problems; evolution of defence technology and procurement programs of armed forces in the Eastern Mediterranean, Europe and the world. The high-quality content is combined with an unrivalled printing quality and the most modern presentation and graphical design concepts where texts, rich and often original and exclusive photographic material, diagrams, maps and detailed tables are dynamically balanced. The same publisher has also produced Ελληνική Άμυνα και Τεχνολογία – Ετήσια Ανασκόπηση (Greek Defence and Technology – Annual Review) ISSN 1792-4022 since 2010, which is characterised by the black, rather than blue, title block.